The MFW16 has eight cases that the 10 teams will be working on. Mediawijzer.net is the Dutch centre of expertise for media literacy and its aim is to increase media literacy among citizens and organizations. Being ‘media literate’ means possessing the knowledge and skills to be able to function consciously, critically and actively in a multi-media world. Once a year Mediawijzer.net organizes the national ‘Media Literacy Week’. How do we get young people to be actively involved in the Media Literacy Week campaign and motivate others to join? How do we use mass media, online media, social media and live events at the Netherlands Institute for Sound and Vision to ensure that we have the biggest impact possible? This results in a campaign proposal to be used during the Media Literacy Week. 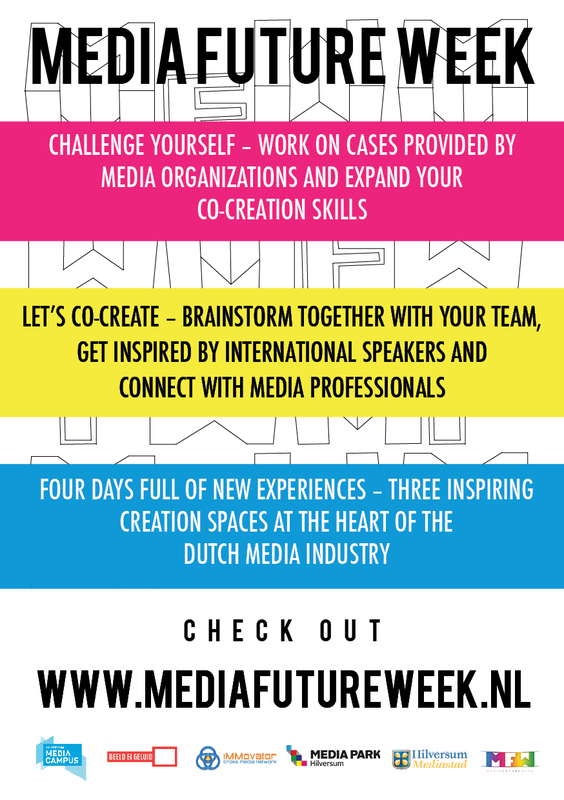 It will show ways of connecting with young people in the Netherlands and how to make it appealing for them to engage in a dialogue about media literacy. The Media Groen case is made possible with support of the Stadsfonds Hilversum. Veilig Verkeer Nederland (VVN) is one of the main traffic safety organizations in the Netherlands and from origin a true volunteer organization. Every day we work with 30,000 volunteers to ensure traffic safety. Regarding volunteer recruitment VVN is in competition with other organizations, leisure activities and work. VVN wants to know how VVN can, by adding unique user experiences and new media, attract a younger audience and make them connect with VVN as well as each other, and have them make a voluntary commitment to make traffic safer within their own social environment? This results in a concept for activities (no campaign) for the target group, i.e. men and women age 25 to 40 (with or without children) that encourages them to contribute on the basis of the task itself (training, planning, guidance, etc.) or by the target group of the activity (children, seniors, etc.). Neffa, Bureau van der Kuil and the municipality of Hilversum join efforts in exploring how smart textiles and LoRa sensor technology can be combined with health and sports to improve the future wellbeing of the citizens of Hilversum. These parties would like to know how to motivate people to start exercising on the outskirts of Hilversum by using smart textiles, biosensors, LoRa sensors and other external influences. What is needed to make people connect on an emotional level, to activate themselves and others, to have them enjoy the outskirts of Hilversum and to form a regular habit and thereby improve their wellbeing? This results in a mock-up product (MVP) that provides positive feedback through the use of smart textiles and sensor technology. The MVP will be tested and evaluated by at least three types of potential customers (personas). The test and evaluation should focus on whether the MVP activates people and if the MVP does stimulate people to make exercising a regular habit. The Netherlands Institute for Sound and Vision is the custodian of the Dutch audiovisual heritage. It collects, preserves and opens this audiovisual heritage for as many users as possible, enabling everyone to learn from it, experience it and to create with it. In the coming years, the Institute for Sound and Vision will completely renew its programming as well as the museum itself. The Institute for Sound and Vision would like to know what would be the optimal customer journey for you and your peers at the Institute for Sound and Vision? How do you design such an experience for millennials? How to motivate peers and communities to get involved with the Institute for Sound and Vision and have them visit the newly designed museum? How to connect millennials not only through physical devices, but also on a social level, within the context of the Institute for Sound and Vision? This results in a concept where a relationship is formed between online and offline activities. Thereby motivating millennials to interact with other groups of visitors such as ‘parents with children up to 12 years of age’, ‘individuals/couples aged 50-69’ and ‘school pupils and students’. BNN is a national broadcaster which makes several digital, radio and television productions, all with a raw, ‘lust for life’ aspect. BNN focuses on youth ánd everyone with a young mind. BNN wants to know how they can participate and stay a relevant player in the major change of the way people (and especially the youth) watch ‘television’ and the way they want their desired content served to them. This results in concepts that are built on the future use of media and shows how BNN remains a relevant media partner by giving the future youth the content it wants, in a way they want to consume it, and in the way they want it to be served to them. VARA is a national broadcaster which makes various digital, radio and television productions, each focused on a slightly different target group, thus reaching a wide variety of people. VARA is a socially involved, independent and progressive brand. VARA wants to know how it can activate all its different target groups and have them go to one platform that evenly reaches, gathers and satisfies the needs of every part of VARA’s broad audience. This results in a concept that serves and combines all different target groups and creates a comfortable environment for all VARA-minded people. TNO is the Dutch Organization for Applied Scientific Research. The focus of TNO’s 3,000 professionals are the transitions faced by society. The Transient Apps Platform (TA Platform) is a service that enables companies to automatically deliver highly personalized and lightweight apps tailored to the users’ context. The developers of the TA Platform wish to know how companies and organizations could use the TA platform to create and deliver better and more relevant apps for users that want to contribute to movements and activate other people. This results in an inspirational slidedeck with wicked and innovative smartphone app concepts and contexts they support.